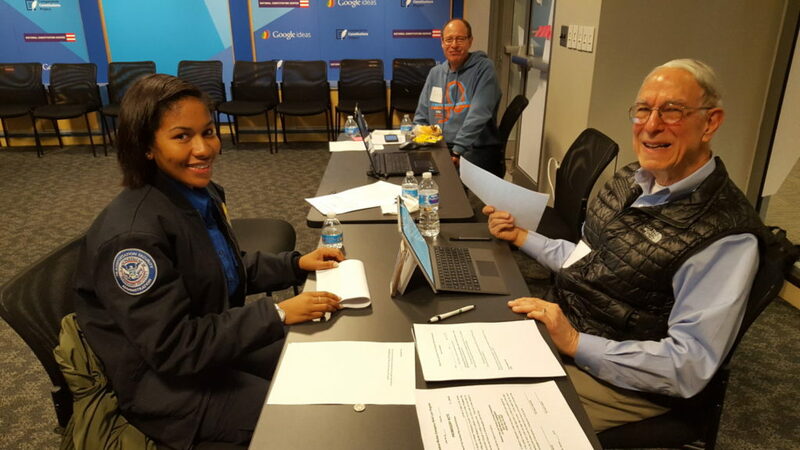 Hebrew Free Loan Society board member Ted Tapper, right, helps process federal worker Tiffany Lee for a loan. Photo provided. When furloughed worker Ira Coleman wasn’t getting paid during the 35-day government shutdown, he used his $1,250 loan from the Hebrew Free Loan Society of Greater Philadelphia for rent and to buy diapers and baby food for his 9-month-old son. A $500,000 donation from an anonymous donor allowed the society to provide no-interest, no-fee loans to 400 federal employees, including Coleman. Hebrew Free Loan volunteers were at the National Constitution Center on Jan. 18, 20, 21 and 22 to process applicants. On Jan. 27 and 28 — after Trump made the announcement — the society continued to provide loans to people who had applied. Executive Director Cheryl Barish Erlick said the organization reached out to federal workers after the announcement and found there was still need. The workers were unsure about the future and when they would receive back pay. New applications, however, will not be processed, as people have returned to work. That situation may change Feb. 15, the new deadline for Congress and the president to come to some sort of agreement to keep the government functioning past that date. The $1,250 loans were available to unpaid and furloughed federal workers in Bucks, Chester, Delaware, Montgomery and Philadelphia counties, as well as in Burlington, Camden, Gloucester and Mercer counties in New Jersey. Religion was not a consideration in the application process. At first, the loan was capped to those making an annual salary of $50,000 but that cap was increased to $65,000. The loan program began when Marshal Granor, the immediate past co-president of the Hebrew Free Loan Society, received a phone call on Jan. 11 from the donor, who said he was heartbroken over stories of federal workers struggling to pay their bills. The donor wanted to help make no-interest loans available to both Jewish and non-Jewish federal employees. The call was made on a Friday afternoon. On Sunday, the society began working to make the loans available as soon as possible. It was not an easy feat for the small organization, which is almost entirely volunteer-driven, with only two part-time staffers. The society needed to set up bank accounts and intake documents to prove the recipients were furloughed employees. It needed to find a place where volunteers could hand out the loans. “We didn’t want to say no,” Granor said. Six days after the phone call, the application was up. The day after that, volunteers began doling out the funds. The application process was streamlined to make it easier for the workers, Erlick said. They could provide some basic information through an online portal. If they met the qualifications, they could come to the National Constitution Center with other documents — such as an ID, proof they were furloughed or unpaid and a paycheck to verify their salary — and pick up the loan. The free loan society didn’t require a guarantor, a condition it typically applies on other loans. The first day saw a small number of takers, but as word spread and it became clear the loans were legitimate, the number of applicants grew. Several of the volunteers recalled one particular woman who wanted to use the loan to pay for her mother’s funeral. Board president Amy Krulik spent several days helping out. There, she heard stories of workers struggling to pay for their rent, medical treatment and student loans. Workers who are unpaid but still had to come to work didn’t have the option of driving Uber or finding other temporary work to make ends meet, Granor said. At the National Constitution Center, Granor also helped out with processing by writing out the checks and handing them to the recipients. He said he saw some of them break down and cry.